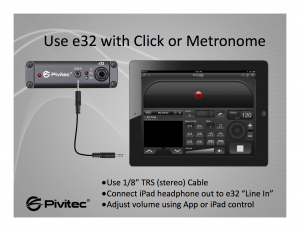 In addition to a high output headphone amp and balanced line level outputs, Pivitec’s e32 Personal Monitor Mixer also has a stereo line input jack on the front panel. This jack makes it easy to insert external audio sources, such as from your iPhone, iPod, iPad or other mobile device. 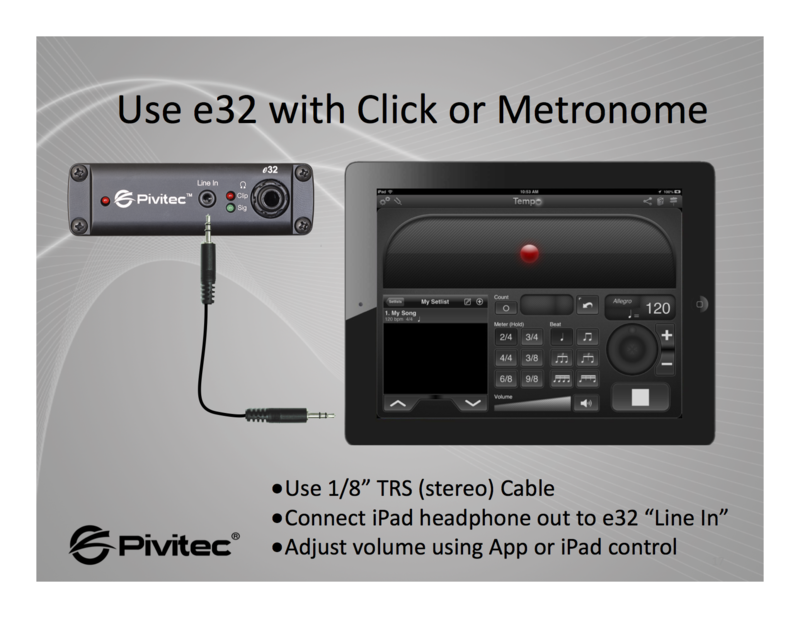 Using this jack is easy; simply connect an 1/8″ Stereo cable from your device to the Line Input on the e32. The signal is injected directly into the headphone and line level outputs just before the Master Volume control. Some great examples for using this feature would be for a click track or metronome or even for playing along with rehearsal or reference tracks. Click tracks are often assigned to one of the network audio channels which are sent to all e32 Mixers on the network. 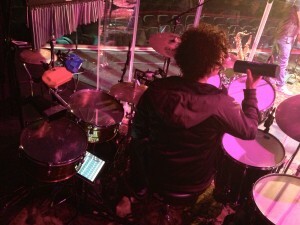 But in some cases it may be more desirable for certain musicians, such as the drummer, to maintain control of the click or where the click is not required by all musicians. This essentially saves up to two network channels to be used for other audio sources. If you have any other ideas for how to use the Line Input jack or if you have any other questions or suggestions for other tricks and tips – please contact us at info@pivitec.com.